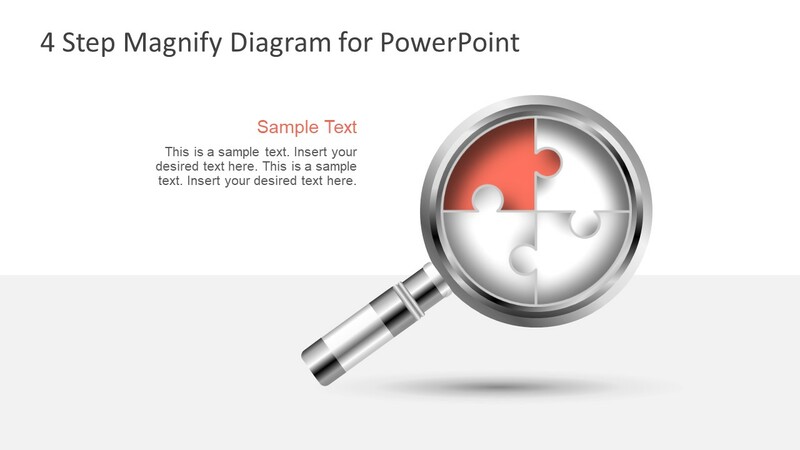 The creative design of Free 4 Step Magnify PowerPoint Diagram is a four stages of jigsaw puzzle presentation. Design by professionals, it illustrates the metaphor symbol of magnifying glass. The magnifying glass metaphor has several meanings, but commonly use as a symbol of search. Like seen in search bars of websites, desktop and phone applications etc. Further, depicts the process of finding solutions, investigating faults and more. 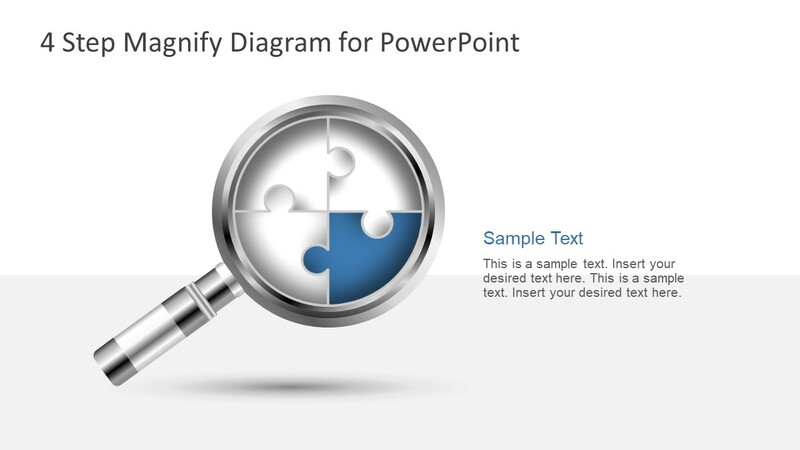 The puzzle pieces in 4 step diagram of PowerPoint can represent variety of presentation. It is a remarkable way to spread the message across. 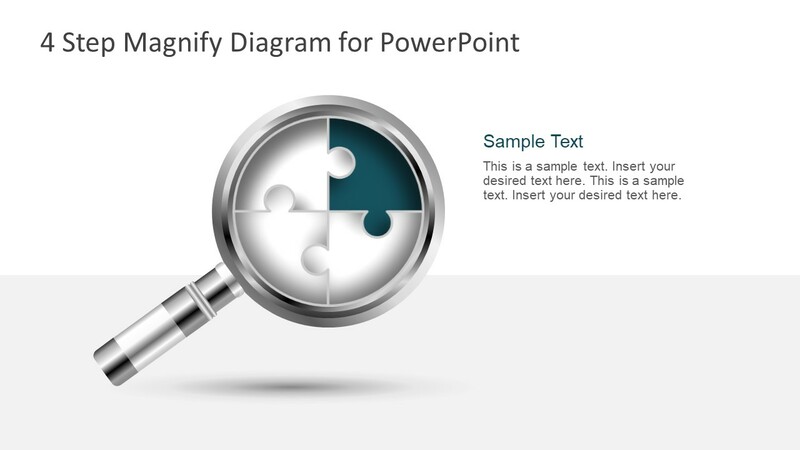 The free template slides are 100% editable in PowerPoint. The Free 4 Step Magnify PowerPoint Diagram is an idea template to demonstrate proposed business solutions. For instance, display the interconnection of smaller units in jigsaw puzzle to explain the achievable outcome. 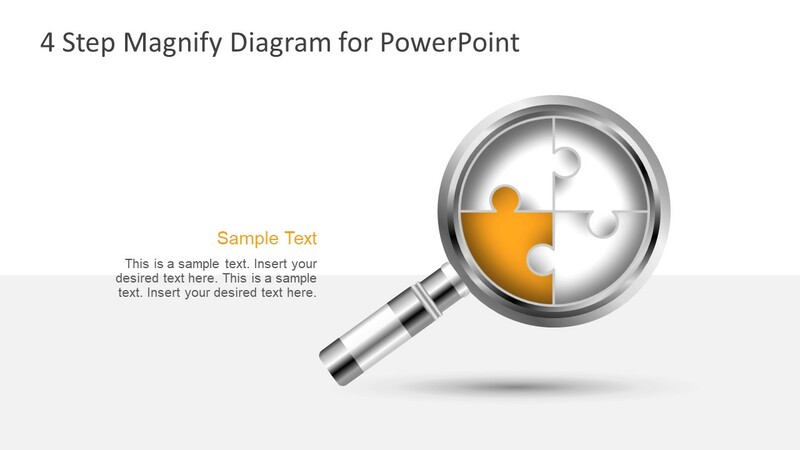 This free PowerPoint template is suitable for every industry specialists to explain a 4 step model diagram. Also, in academics, the students and teachers can present the 4 stages of process. The users can make many changes in the design of PowerPoint template. Such as, editing the colors, size of magnifying glass shape, moving the objects like placeholders. There are numerous customization options for shapes, backgrounds and special effects in format, design, transition and animations. 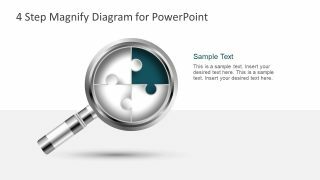 The free template of 4 step magnify diagram has an interactive display of high resolution PowerPoint shapes. Therefore, any change in the size, and formatting of image does not affect the overall quality. 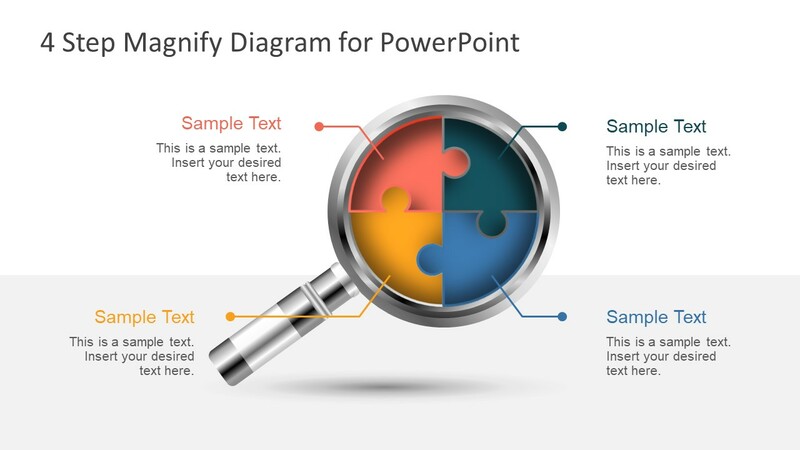 This PowerPoint has 5 slides containing one main and four subsequent slides. The first (main) template can give an overview of topic using the placeholders to enter key points. However, the next four slides have one highlighted puzzle piece in each to further explain the unit in detail. The interconnecting pieces of jigsaw puzzle depicts interdependency and corporation through processes. 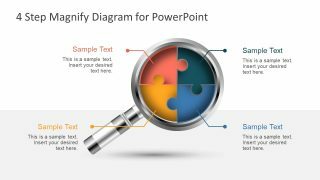 Our PowerPoint Templates are compatible with Google Slides. Take the most of every platform using the tool you like.